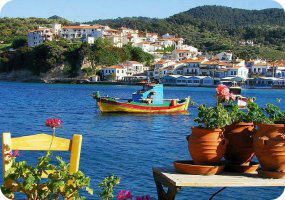 Book now the best shore excursions in Samos. High quality and safety at the lowest prices. If your are looking for Shore Excursion Samos, book now the best guided tours at lowest price with Ancora Tours. Since 2003 we offer you official guides in english, transportation and travel insurance, all included. The highest quality at the lowest rates. What’s eating: Chtapodi sti schara: grilled octopus in vinegar, oil and oregano. Souvenir: Muscats grapes grow in vineyards across the island, so make the most of this and take home a bottle of local wine. The Samos shore excursion leaves port and heads towards the Bay of Vathi. Situated in the northeast, it’s considered one of the most interesting and beautiful areas of the island. The port of Samos is visited every year by hundreds of tourists fascinated by the sea, culture and tradition of this island. We will visit the old town: Ano Vathi situated above the port. We will have a walk along the alleys of the centre and will reach the Arqueological Museum (external visit). We will continue our excursion visiting the wine museum and for those who want we can enjoy a traditional wine tasting. Before retuning to the port we can enjoy some free time in the centre where we can buy some traditional pottery or local wine. The Samos shore excursion will then head back to port for boarding.